This puzzle offers a higher level of challenge and the larger finished size works well for people working together to complete a puzzle. Puzzle is 11.5 X 16.25 when complete and is made of a thick, durable chipboard . 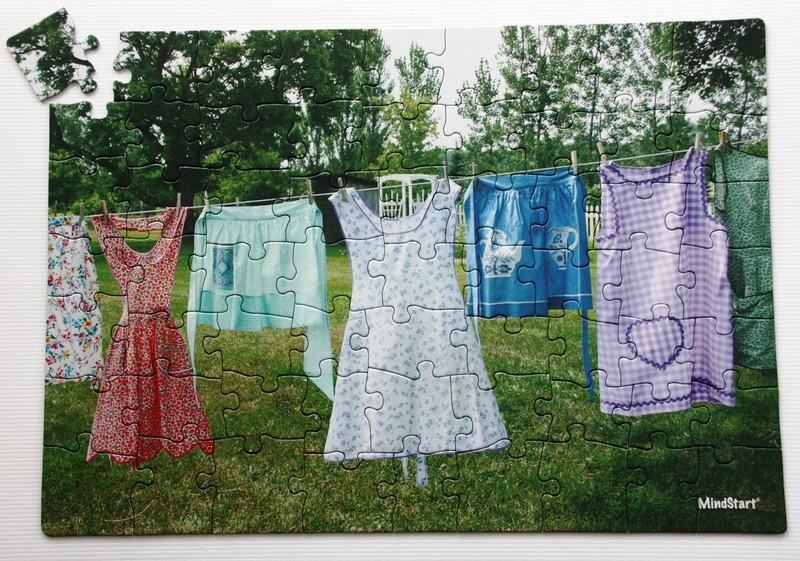 The puzzle image inspires thoughts and conversation about time outside or doing house chores. Consider for Mild Cognitive Impairment, very Early-stage dementia, and adults who want something simpler and faster than traditional adult puzzles. Therapist Tip: Setting jigsaw puzzles provides brain exercise to people, such as: visualizing and determining how the pieces should be oriented and fit together (visual-spatial skills); matching of colors; dexterity of the fingers; and concentration. MindStart puzzles are especially good for people who want a simpler puzzle, who have mild memory loss, or are patients in therapy for stroke, head injury, or Parkinson's. This is a great puzzle for dementia patients that need more stimulation. This puzzle is perfect for those that can still stay mentally engaged for awhile. I work at a mental health hospital with geriatric patients. I found this to be just the right intricacy for my patients. I also liked the picture. I found it durable and easy to clean off. I recommend this puzzles and others like it! This puzzle worked really well with my sister-in-law. The number of pieces were just right and she was so proud of her accomplishment. We were able to share fond memories of when our mothers and grandmothers wore them. We talked about how they were used, like gathering eggs and picking up apples. Many of the aprons were made with love. Thanks for the memories. My mom loves this puzzle and reworks it weekly. Several months ago, she was dismayed when a piece went missing. The company's excellent customer service helped me out and mom and I are both delighted. Mom Also does the 12 piece puzzles but thinks they are sometimes too easy. This is her favorite.